Rega RX1 review | What Hi-Fi? Peculiar how you can have everything you thought you wanted and it still doesn’t make you happy. Frustrating, too, that you simply cannot measure the pursuit of happiness, there are no tick boxes or instruction manuals to follow. The same could be said for hi-fi. You can reduce distortion to the absolute minimum, track rhythms diligently and express certain dynamics with consummate ease, yet still come up somewhat short as a listener. There’s no algorithm, no discernable measurement that reads “feeling”. As with any pair of speakers, there are compromises with Rega’s RX1s. But most of our discussions while testing them centre on that unknown quantity: why aren’t we enthused by what we’re hearing? 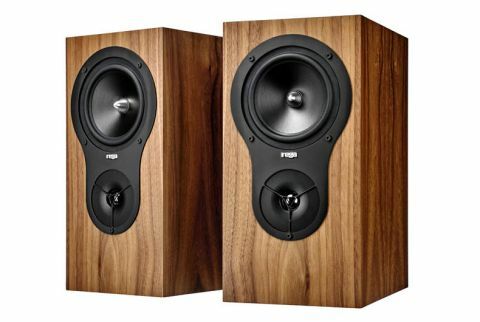 These speakers have an attractive but unassuming speakers-next-door look we like, standing out due to a driver configuration that sits the mid/bass unit above the tweeter, but otherwise blending gracefully into the rest of the room. From their heft to the wood veneer finish, they feel well made without being overly lavish, indicating a focus on build quality rather than flash exterior. The manual suggests experiment with positioning, so we begin testing with them toed in, a metre or two from surrounding walls. However, even in our generously-sized test room, we end up with them close to the back wall and square to it. Ideal, then, for those with limited space. We play Four Tet’s Rounds and sonically, our focus is drawn to the RX1s’ immaculate sense of timing. Aided by a wildly impressive knack for organisation, not a beat is missed, with synth lines and samples cutting in and out with precision. Could a full orchestra trouble those same attributes? Not a chance. Gustav Holst’s Planets is mapped out as if by a cartographer, spotlighting each solo without embarrassing it in front of the class. What is lacking here is some body. It’s less noticeable with the Regas close to the wall than at the centre of our listening room, but still present. Lower frequencies are agile, but lack the authority you’d expect from either of the above recordings. That sonic base is missed perhaps even more so when it comes to vocals. Switching to Nina Simone’s Baltimore, it’s as if we’re missing those low-end harmonics that allow you to believe the recording you’re hearing is a real voice. For our money, the balance slips just the wrong side of the line between light-footed and lightweight. But our main gripe is that we just aren’t inspired by the RX1s. They don’t make us believe in the performances from the records we’re playing. Tracks such as Black Math from The White Stripes’ Elephant, for example, feel metronomic rather than confrontational. Everything is in the right place, but there’s none of the grit that ought to make the performance a more exciting listen. Rega ticks most of the boxes you’d want from a pair of speakers, but the RX1s amount to less than the sum of their parts. The performance is certainly better balanced when we swap our reference Gamut amp for a Rega Brio, which injects some impetus back into the presentation, but there’s still some way to go before we’d be shuffling to the edge of our seat. We play the same records again using a pair of Dynaudio Emit M20s, £200 cheaper but our Product of the Year and Award-winner in the Regas’ price bracket. They don't quite match the RX1s for space, though they organise instruments well within what they have to offer, but that level of expression is there. They make the music feel whole and alive. These Regas are not without merit, and careful pairing can certainly make a difference when it comes to the body and the life we feel they’re lacking, but even still there are a host of alternatives for which we’d opt before these.